Over the last ten years, pregnancy has not only become more complicated for many women, but the traditional provision of general intensive care units has been reduced. To bridge this gap, critical care units, usually staffed by midwives, have been set up in many maternity units. This textbook is an accessible and comprehensive introduction to this emerging area of practice. Critical Care Assessment by Midwives also notably sets out a template for assessment of women that will enable early identification of deteriorating health. Serious illness can arise subsequent to an emergency, a pre-existing illness or a complication of pregnancy but can also occur in the context of what appears to be a low risk pregnancy. For this reason, all midwives need to be skilled in assessment that facilitates timely, appropriate referrals and saves lives. ketoacidosis, hypoglycaemia and sickle cell crisis. 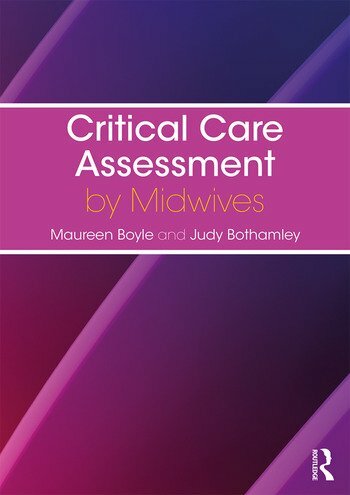 Covering the context of care, relevant pathophysiology, signs and symptoms, specific assessment in detail, relevant drugs, assessment of the fetus, summaries of management, psychosocial support and the specific professional responsibilities of the midwife, this is an essential guide for all midwives and midwifery students. Maureen Boyle is a Senior Lecturer in Midwifery at the University of West London, UK. Judy Bothamley is a Senior Lecturer in Midwifery at the University of West London, UK.